The Israel Antiquities Authority unveiled a rare ancient seal that underscores the bond of the Jewish people to Jerusalem. The Israel Antiquities Authority held a special press conference in Jerusalem's City of David on Sunday to unveil a rare coin from the Second Temple era. The cartouche – or seal – never seen by the public before, is the size of the modern New Israeli Shekel coin and bears the Aramaic inscriptions “it is pure” and a two-letter abbreviation for the name of God. It was discovered near the Robinson’s Arch at the southwestern corner of the Temple Mount. Archeologists say the soil layer above the Herodian road where the seal was found was dated to the first century BCE. Archaeologist Eli Shukron of the Antiquities Authority, and Professor Ronny Reich of Haifa University, who oversaw the excavation, explained to reporters the significance of the coin. "This is the first time an object of this kind has been found. It is direct archaeological evidence of Jewish activity on the Temple Mount during the Second Temple era," they said. "Products being brought to the temple had to be stamped pure – which is what this seal was used for," they added. Such seals are mentioned in the Mishna and discussed in the Talmud – but the cartouche unveiled today does not match any of the four inscriptions included in extant texts. "What we know is brought down from the surviving literature," the archeologists said. "Here archeology has brought us something new." Minister of Culture Limor Livnat and Minister of Education Gideon Saar joined dozens of students for the unveiling. 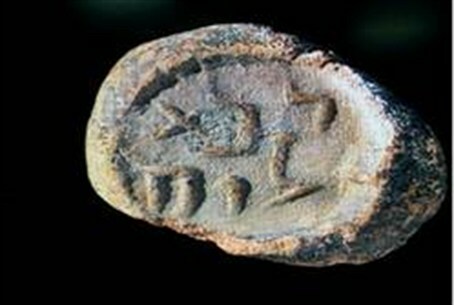 Saar said, "The seal shows the deep connection of Israel to the City of David. It is important excavations like these that demonstrate our bond to Jerusalem. Everything uncovered here strengthens us." In addition to the seal other artifacts were discovered dating to Second Temple period, and some to the days of the Hasmoneans – such as oil lamps, cooking pots made of clay, a jug containing oils and perfumes, as well as coins of the Hasmonean kings such as Alexander Jannaeus and John Hyrcanus.